Can this trio be the Guardians of the Galaxy? With the Cubs doing their best to load their farm system with as many elite hitting prospects as humanly possible, a lot of fans have been downright giddy about the potential of the future. And rightfully so. These guys have a ton of talent. On the other side of it, many have shown their own special brand of concern over guys who are “just prospects.” This argument points to the fact that prospects have a tendency to not be as good as we think they'll be, and usually invokes the names of Corey Patterson, Felix Pie, Josh Vitters, and others. Those who pay attention know that this isn't fair. Patterson was rushed by the Cubs, and anyone could see the issues with his swing when he reached the Major Leagues. Vitters was drafted high out of high school as a guy with a bat but no patience, questionable work ethic, and poor defense. Pie never learned which pitches to lay off and which to swing at, and the Cubs just called him up anyway. For reasons that are a mixture of failure on the part of the players and failure on the part of the Cubs, these guys never developed into the players many thought they'd be (although Patterson had several really good seasons in the Majors, and Vitters may still make it as a platoon guy or bench bat). In many ways, these guys aren't fair comparisons with guys like Javy Baez, Kris Bryant, and the others. If you want to make the argument that prospects sometimes go bust, don't just point at the failures of the previous Cubs regime. It's a lazy argument and makes you look like you don't pay attention to baseball well enough to name anyone outside of the Cubs. Other teams have top prospects that bust, too. All players have flaws, of course. The biggest thing standing between Jorge Soler and a successful Major League career is his own ability to stay on the field. Bryant's biggest concern is long-term ability to play third base. Javy Baez is high-boom, high-bust potential. Enter the Andy Marte comparison. I know what you're thinking: aren't you the same guy who compared Javy to Pedro Alvarez? Yeah, that was me. And didn't another writer on Cubs Insider write about why comparisons are stupid? Yes, that did happen. No two players are exactly alike, but we can use Marte as a cautionary tale for Baez. *Click here for full stats. “Scouts say that Marte has very quick wrists, helping him generate plus bat speed even though he's not the biggest physical specimen in the universe. He has power to all fields, can pull the ball for home runs, or hit to the opposite field gap when needed. He still needs to improve his plate discipline, but he made huge strides in that regard last year, increasing his walk rate substantially. He will still lunge outside the strike zone occasionally, but that should ease with time. It's hard to really say what went wrong for Marte. His K-rate wasn't extreme and his BB rate was low but not awful. The guy just struggled to hit elite, MLB pitchers. It's the problem with falling in love with prospects. Sometimes the “can't miss” guys do, in fact, miss. Even the prospect gurus get it wrong sometimes; Jason Parks of Baseball Prospectus wrote a good column on the topic. To put all of your eggs in the basket of a single prospect to be a star that elevates your team to a championship level is foolish. The same is true of expensive free agents on the wrong side of 30 as well. But the Cubs have set themselves apart. Fans don't have to project all their hopes and dreams onto Javier Baez. This isn't “cross your fingers that Marte takes over for Chipper Jones someday.” It's not Patterson, Pie, or Vitters, either. If Baez goes bust, it's gonna be okay. The Cubs have a safety cushion. 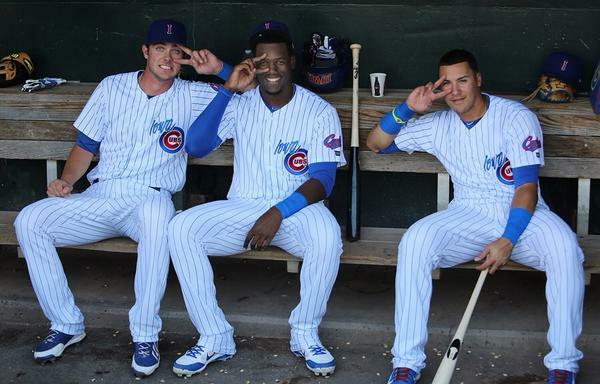 If only half of the Cubs hitting prospects end up being good, they're sitting pretty. Go ahead, pick just three or four of Bryant, Baez, Soler, Arismendy Alcantara, Albert Almora, Addison Russell, and Kyle Schwarber. Add that to Castro and Rizzo. Fill in some role players and, guess what? You've got a really good lineup. When you see guys fill out their 2016 or 2017 fantasy Cubs lineup, it's usually most of these names filled somewhere around the diamond. But I'll tell you right now: don't count on it. A few of these guys will end up elsewhere. A few may not be good enough. It's unrealistic to expect all of these guys to make it. But then again, we don't have to; it's all part of The Plan. There are many precedents of talent that failed to materialize. This is true. Brandon Wood, Lastings Milledge, Delmon Young, etc. I think it's important to continually note as a fan of the rebuild that I understand the likelihood that only a minority of the heralded prospects will actually succeed at a high level. It's a bit grating to see all these future projected lineups with nothing but talent the FO has drafted or culled as prospects from other teams. That's all well and good for dreaming, but it's just foolish to think that it'll happen. And my buddy Nick thinks anyone who supports the current rebuild feels that way, so it's nice to provide a more realistic POV. Hey, mobile readers, sorry about the appearance of the charts. Ryan did a good job getting them in and I edit from a PC, so the display shows scroll bars, negating that extra stuff that you see in mobile view. Working on a fix. I did it on PC and just recently was informed how it looks on mobile. To go even further with it, I'd say that it's likely that out of the 8 guys you mentioned Ryan, only one will become a standout superstar player, two might become average or a little better, and one or two of them may only be serviceable. Which, sign me up for that. I saw a study a couple years ago when the rebuild started and I don't recall the numbers exactly, but even the can't miss guys flame out at an extremely high rate. I would personally put Bryant in the HOF already. If I had to guess on the rest, I'd say Soler and Russell will become better than average players and Almora and Alcantara will be serviceable. That leaves Schwarber and Baez as my busts. I suppose I miss counted when I said 8 guys before. I don't necessarily disagree with any of those projections. However, keeping it in perspective, some guys have real issues. For me, Baez' long swing will be an issue despite his bat speed. And Schwarber's lack of position will hurt him. Although, Iwouldn't be surprised if those two were very successful and it was two other guys that flamed out. But, as your article suggests, odds are we shouldn't be heart broken if a couple fail. We shouldn't, but we will anyway. We've emotionally invested in these guys like never before. To see Javy come up and never be able to make consistent contact would be heartbreaking. But, teams with good farm systems that have a lot of talent and depth are built to survive the busts.